There’s a tree on my street that has convinced itself that it is autumn in the Philippines. For those of you unfamiliar with Filipino weather, there is really no such thing as autumn in the Philippines. All we know of seasons are wet and dry, hot and hotter. I ride by this tree every morning, right at the corner of Peter Street. It’s leaves are almost all gone, and the silhouette of it’s slinky bark and branches are exposed. I hadn’t been paying enough attention in the weeks or days before the leaves fell, so I am no witness to the process; but I doubt this tree’s leaves changed color with that fiesty passion, the way they do in landscapes that endure four seasons each year. I feel a little bit like this tree, undergoing a season it believes it is accustomed to, in a landscape that finds it’s journey a little strange, a little unexpected. The greenery here is largely unchanging all throughout the year. Everyone has their good days and their bad days. On some days, I sit in limbo for a bit, bouncing simple questions around my head that would drive a philosopher mad. The questions are simple and self-searching, but also posed emotionless and without consequence. All these questions try to carve reason out of my blunt edges. Some days I feel I run on autopilot, in a happy but strange way. In this scenario, I am the pilot who finds herself sitting on the nose of the plane I am supposed to be flying, while it is soaring still safely through the atmosphere. (Scientific realities and probabilities must be set aside for this imagery.) The view is magical, and the plane is doing what it must be doing, but something is a little odd, a little outside of the body. On contrasting days, I am giddy from right below my sternum and through my being. On those days, life is inspiring, I am recharged and all my previous questions melt like chocolate in my mouth. All it takes is a good meeting. A ball released to roll into a plan. A new connection. An old one restored. Some days, all it takes is a tug on the line, on one of the lines I’ve thrown out into the water that from day to day shifts from murky to clear, and back again as it pleases. These days are the affirmation. Over the twelve months of the year here, green is just green. Green does not often redden or yellow, or fall off the trees. Not all together does green dry up and curl into the crisp crunches below your stomping feet. Green stays within its family of green – no new green of spring, or cold green of winter. Well at least green does not season here, the way it does in the place I last lived. They live and die, yellowing and browning in their own time. Here, it seems the earth does not prompt man to think and feel collectively the passing of time, the changing of season. Time is not forced upon you by the chill of the air or the warming up of the sun. Cycles of death and life are not thrown at you by the daily voice of the weather. You must explore the passing of time in your own terms. Again, I am like that tree on my street, undergoing change, undergoing transition, nudging new life out of my extremities. Some days I don’t understand why my leaves are falling, and why those of other trees do not. All I know, is that for this season, I am planted where I am supposed to be, growing upright, growing outward. Some days the question is not why. Some days there is no question. Just a wondering – about the burden that God has put on my heart, one I cannot eloquently name or place as of yet. Though I call it burden, it does not feel like one, but rather its presence and its impetus are as ordinary as deciding to eat when you are hungry. You just eat. You just do it. No need to reason why. I miss the fall. And the people I have previously walked through the season with. The fire and bright that overwhelms the landscape during this time is arresting. Every day something is different, every day a new color, a new urgency. Unlike the tree on my street, I don’t want to skip the process of autumn, though it is not around me. I want to sink into it, enjoy it. I will let my colors change, burn and swing away. Then I will keep trucking through the winter, in whatever form it finds me. Previous Post Oh so you’ve got a career now?? Cute. Thanks for this Tee! I saw this post come into my email a few days back but only got to reading it this morning. Again, it is so well-written(duh! David). Interestingly, it reminded me of Psalm 1:3 where the Bible talks about us being like a tree planted by the rivers of water which yield fruits in its season. When I think about this tree (referred to in this Psalm), I picture one that is not affected by the conditions around it just like the tree on Peter street. 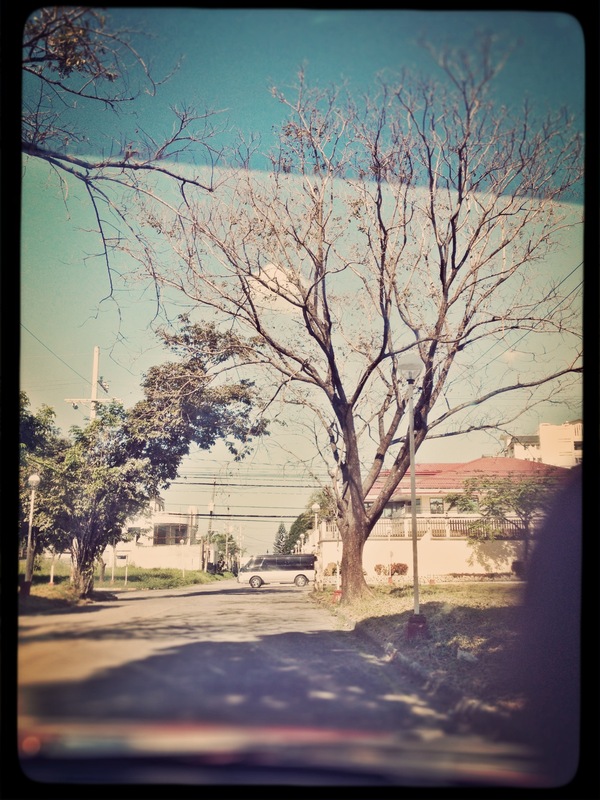 It’s in its own cycle of life and not dictated by the seasonal cycles of Manila. I guess it really spoke to me because it’s reminder that once we totally depend on God, He’s got us. He creates an entire and exciting cycle of life that’s aligned to His plan. And the best part about it is we end up not being defined by the changes in our environment but by His work in our hearts.